The Gombe Hospital is a 100-bed government hospital located in Central Uganda, About 75 Km from Kampala. Like many public facilities, it lacks funds for infrastructure and specifically for replacement of worn beds and mattresses. The condition of hospital beds at the Gombe Hospital is deplorable. Mattresses are worn, bedding worn or non-existent and the metal frames of many of the beds are in need of repair. The hospital has requested help from CanAssist to repair many of the bed frames, buy 60 new mattresses and blankets and replace worn mattress covers. The estimated cost of this project will be about $5000 in total. 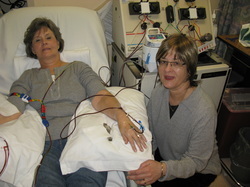 Faye Koshel is a Canadian woman who was diagnosed with Leukemia in 2008. She has spent many nights in hospital in the past five years and is grateful that this care has been available to her. She celebrates 5 years of being cancer-free this year. In appreciation for the care she has received and particularly for the gift of Stem Cells from her sister, Elva, she wishes to encourage her friends to join her in supporting this CanAssist Hospital Bed project at Gombe Hospital. Here is good news from the Gombe Hospital. Mattresses, covers and bedding have been purchased and labelled. 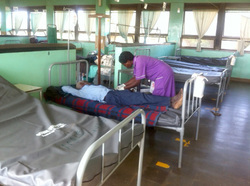 One hundred beds have been refurbished and are now in service at the Gombe Hospital. CanAssist is accepting allocated donations to Elva's Stem Cell Thank-you. Donations can be made by credit card using the Canada Helps link below or by check to CanAssist African Relief Trust, 562 Sycamore Street, Kingston, Ontario. K7M7L8. Donations of $25 or more are eligible for a tax receipt and all the money donated to this fund will be spent in Africa.